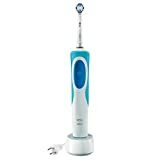 The oral-b pro 500 rechargeable electric toothbrush provides a clinically superior clean vs a regular manual toothbrush. The pro 500 toothbrush head removes up to 100 percent more plaque vs A regular manual toothbrush. Compatible with the following replacement toothbrush heads: CrossAction, 3D White, Sensitive Clean, Precision Clean, FlossAction, TriZone, Deep Sweep, ProWhite, Ortho, PowerTip, and Dual Clean. This entry was posted in Dental Shop and tagged Braun, Electric, OralB, Power, Powered, Rechargeable, Toothbrush by Oral Health Care. Bookmark the permalink.